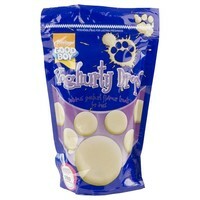 Good Boy Yoghurty Drops Dog Treats are a fabulous alternative to chocolate treats or other treats with a high sugar content. Perfect for giving to dogs which may either be prone to weight gain, suffer from bad dental health or hyperactive dogs that are affected by sugar. This unique formula has in fact proven to be beneficial to your dog's health when given alongside a well-balanced diet. The added Vitamins A, D3 and E support healthy skin, strong bones and good eyesight. This product is also safe for dogs with diabetes. Great small treat for our diabetic dog, Rags. He was a dog used to having lots of treats until diagnosed with diabetes so these are ideal.